Do you lack space for a traditional free standing fountain? If you still want to add a water feature to your backyard a swimming pool fountain could be right for you. 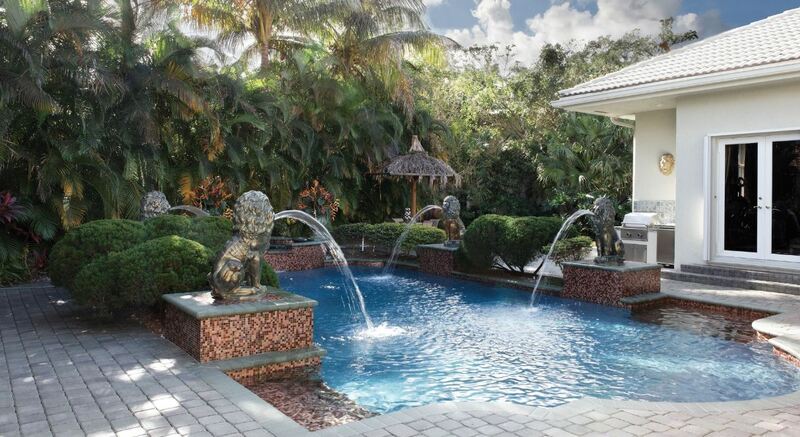 Here at Artistic Statuary in Pompano Beach Florida, we manufacture and design a large line of fountains for a pool. We supply for some of the largest pool builders in the state. If you’re getting your pool newly built or redone we create concrete tables and fountains that can be the perfect addition. With our cast stone scupper bowls and lion fountains the most popular choices. We are experts at setting up fountains to existing water lines. 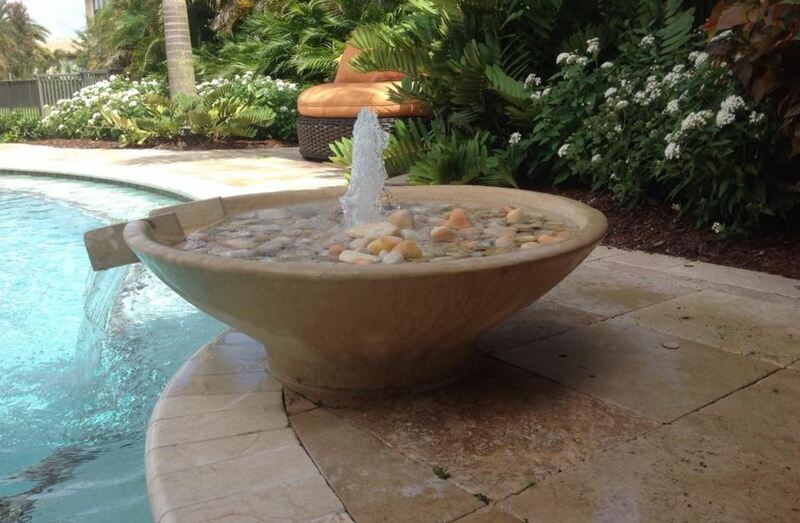 So if you have an existing fountain in place in your pool that you want to replace we can help you out. If you’re looking to add a fountain to an existing pool, without a waterline from the pool pump available we would need to get you in contact with a pool builder first. We want your swimming pool fountain done right. We won’t cut corners trying to do something were not experts at. Our cast stone scupper bowls come either square or round, and in three different colors bone, grey, or white. The square low bowl with a scupper come 32″ X 32″. Our round lowl bowls with a scupper come in 4 different sizes with a differing diameter of 25″, 29″, 33″, and 36″ inches. 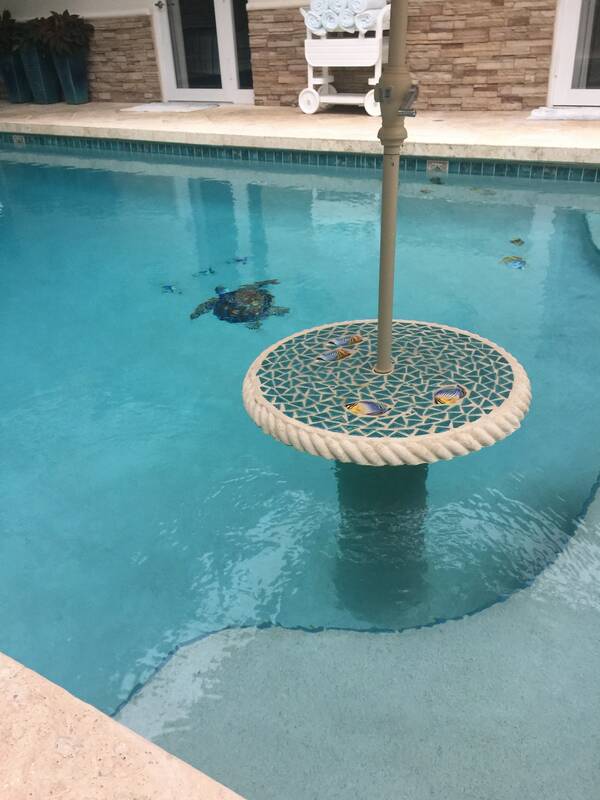 All of our scupper bowls are manufactured right here and South Florida, and sold to some of the biggest pool builders in the state. If your a pool builder and want to find out more about how affordably you can add some flare to the next pool you build give us a call. We are also experts at setting up our concrete table sets and benches on land. Underwater we don’t fare so well. 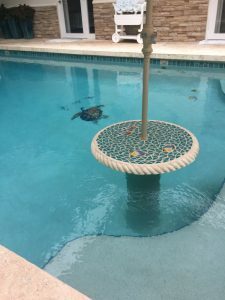 So if you’re looking to add a concrete table top to your pool then we can help you with the table and get you into contact with a pool builder. Whether its a swimming pool fountain or a table top it will only look perfect if it is professionally installed. If your looking for a bronze statue to use as a fountain we carry those as well, but we do not recommend using a bronze statue for a swimming pool fountain. The chlorine from the pool will eat the finish right off the fountain. If you decide to put a bronze fountain in a traditional fountain basin we recommend waxing it every couple of months to keep the patina. Want to learn more about the traditional free standing fountains or swimming pool fountains we offer? 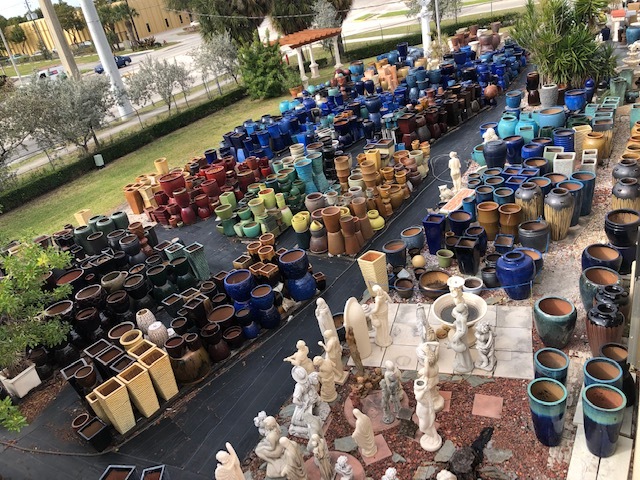 Give us a call at 954-975-9533 or email us at info@artisticstatuary.com .